History: "From High Olympus, celestial retreat of the ancient gods, comes Mercury, the fleet. He is sent by Jupiter, the All Wise, to the tumultuous, war torn world of the Twentieth Century. Mankind must be saved from self destruction and Mercury has been chosen to battle the Evil One who is spurring man to this disastrous end--Pluto, Prince of Darkness!!!" Worrying that mankind was being tempted into destroying themselves by Pluto for his amusement, Jupiter takes up the suggestion of the Goddess of Wisdom, Minerva, that he send another god down to Earth to help the mortals and thwart the God of the Underworld. After considering his options, Jupiter decided to send Mercury, God of Speed. Finding his opponent posing as the dictator of Prussland, Rudolph Hendler, Mercury messed up his plans by intercepting every order he sent to the battlefield, leaving his army directionless. Comments: With only one issue of Red Raven published, Mercury proved to be a one hit wonder. 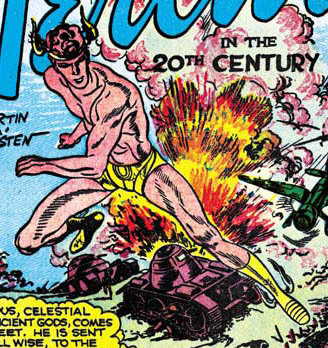 However he nearly returned when Hurricane was introduced - the first Hurricane story was a redrawn Mercury story, though afterwards that worthy enjoyed several appearances written specifically for him. In more recent times, it was revealed that both Mercury and Hurricane were identities taken during the Second World War by Makkari, one of the Eternals, and that his enemy Pluto was actually the Deviant, Warlord Kro. Makkari was even seen using the Hurricane identity as a member of the Monster Hunters (Marvel Universe #6-7). However, for the purpose of this entry, I'm treating both Hurricane and Mercury as they were in the Golden Age - distinct characters in their own right, with their origins taken as being honestly recounted and correct. If I ever get round to doing profiles for the main Marvel characters, I might eventually do one for Makkari, at which point I'll include the modern spin on this guy there.